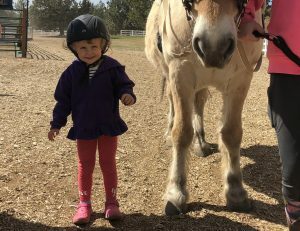 The movement of the horse is multi-dimensional and stimulates what a normal walking pattern should feel like: its rhythmic, consistent, and predictable, and cannot be duplicated by any piece of equipment. Physical therapists use the walking patterns of the horse to improve core strength, balance, coordination and increase overall function. The client is given the opportunity to experience more normal movement patterns which can improve posture, balance, sensory integration, and gait. Healing Reins provides both pediatric and adult physical therapy. 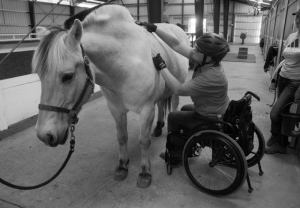 Healing Reins partners with contract professional Trudi Trygg PT to provide adult hippotherapy. Learn more about Trudi Trygg PT. Initial applications can be accesses above. Physical therapists spend 30 minutes with the horse and 30 minutes in the on-site clinic. Complete the Healing Reins Online Application above. Contact Treehouse Therapies for information regarding treatment.